This 5-minute video is awesome, especially for those of us who spent our youth passing from my hometown of Edwardsville, Illinois through Collinsville, and into Fairview Heights, where the mall was located. The World's Largest Catsup Bottle rested along that path. It was always completely natural to the landscape. It never seemed out of place and we never questioned it. Who knew there wasn't one of these creative and colorful water towers every 50 miles or so along the highways and byways of America? I kind of feel the same way about Edwardsville as alt-country rocker Chris Mills feels about his hometown of Collinsville. This is what he said at one of my favorite music sites, Magnet. Mills: I used to talk a lot of trash about my hometown. But Collinsville, Ill., isn’t actually all that bad. It’s relatively safe. The friends I still have there and people I still know are all pretty awesome. The school system wasn’t that great, but it got me where I am today. I’m sure that its proportion of less-than-progressive gun-toters is not that far above or below the national average for towns of its size and general geographic location. 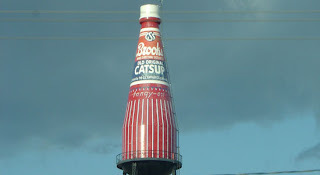 But regardless of my feelings about growing up there, Collinsville does have one amazing, magical thing that no place else in the world has: The World’s Largest Catsup Bottle. It was built in 1949 as a water tower for the Brooks Catsup factory, and for the majority of my youth, it was just a rusty, dilapidated shadow of what I imagined it once might have been. But in 1995, the local community rallied together to stave off the tower’s impending demolition and managed to restore the giant condiment container to its former glory. I think it has even been declared a historic landmark or something. Love to hear about my hometown. Glad you like, Anonymous. I don't have that much more about Collinsville, other than Michael Stipe once lived there, a lot of Scott Air Force Base people have moved through there, I used to play soccer on a traveling team named the Collinsville Chiefs, and one of my old bands, Birmingham Squadron, used to share a practice space there with C-ville band Vega Basin. Michael Stipe told me, back in 1982, that he also took a few classes at SIU-E between graduating from Collinsville High and heading to Athens a couple of years later--and he said even took a theatre class (but could not remember for sure the professor). That's an awesome story. I was an SIUE communications major several years later. But the whole reason I lived in Edwardsville (and my parents are still there) is that my dad moved us all there to take a job as ... a theater-history professor in SIUE's theater department. I wonder if he can look back through his records to find the name of a certain young Mr. Michael Stipe.